* Waste Management: Household garbage and recyclables. * Pelican Waste: trash, debris and oversized items. Residents should use the 96-gallon brown HCUA cart for garbage and the 35-gallon green cart for recycling. Bagged garbage or recycling outside the carts will not be picked up. Carts should be placed outside by 6am on your day of service. The cart should be placed curbside with the handle facing your home. It should be placed at least two feet from vehicles, shrubbery, fire hydrants, mailboxes, etc. Do not block sidewalks or driveways or place carts in the street. Trash (limbs, clippings, bulky items like furniture, etc) should be placed by the curbside. All leaves and grass should be bagged. Who do I call if I have questions or need to report a service issue? HCUA has a dedicated phone number to handle all customer service related calls – (228) 701-9086. Simply follow the automated prompts for the service type you are calling about. Option 3 will take you to the HCUA office to answer any other questions not covered in the phone menu selections. Can I get a second cart? Residents who would like a second cart can get one for $2.44 per month ($29.28 annually). Please call Waste Management at 228-328-1820. You will be billed annually by Waste Management for the second cart. What will my bill be? HCUA does not bill residents directly - they only manage the collection and disposal services and bill the cities and county. Bills are based on the number of customers in each city/county based on a house count that is conducted on an annual basis. HCUA’s estimated bills to the cities and county is $14.33 per month per home for home services. Residents will receive their bills from their respective city. Contact your City with regard to any possible changes to your current bill. Residents in unincorporated Harrison County will continue to their garbage/recycle/trash bill included as part of their annual county taxes. For any questions regarding this assessment, please contact Harrison County directly. What items can be recycled and how should they be disposed of? * There are two household hazardous waste programs currently available for the citizens of Harrison County. 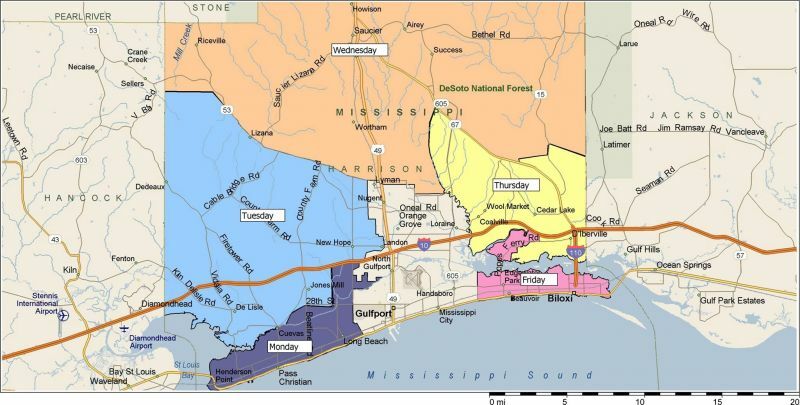 Both programs are funded through Harrison County and the Mississippi Department of Environmental Quality (MDEQ). * Monthly Household Hazardous Waste Collection Day: Held the 2nd Saturday of each month from 8am to 12pm at the Harrison County Road Department (next to the Sheriff’s Work Center) located at 10076 Lorraine Road in Gulfport. * The following items are accepted: latex or oil based paint, used cooking or automotive oil, antifreeze, household, car or marine batteries, aerosol cans, flammable liquids (like gasoline), white goods such as refrigerators and freezers, fluorescent light bulbs,, computers, cell phones, telephones, televisions, and tires (up to 25 per household). * Each spring, another hazardous waste day is held to include the above items and also chemicals and pesticides. * For more information, please call (228) 214-1405. * Paints & Thinner Disposal: Paint cans should be empty and dry before disposing. Reduce the need for excess paint by only purchasing the amount you need or use it somewhere else or donate leftover paint to an area charity or civic group. * Yard Waste: Use your leaves in flower beds and below shrubs to act as a natural ground cover and soil enhancer. * Waste Reduction Tips: Look for products utilizing least wasteful packaging or recycled materials; avoid using disposable versions of razors, pens, lighters, batteries, and diapers whenever possible. ; buy concentrates, “family sizes,” buik items and returnable containers to reduce packaging waste; buy products made from recycled products and products made from glass, metal and aluminum, as these products can be readily recycled.